I go through phases where I bake all the time and then not at all. I've been going through a baking kick lately. I love desserts with fruit in them, and now's the time to bake with fruit. 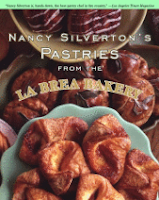 My favorite recipes are from Nancy Silverton from LaBrea Bakery. I've had pretty good success with her recipes. They are not simple or quick to make, but they are always delicious. Baking is tricky. The slightest mistake can mean disaster. Sometimes you don't know what you did wrong. It just didn't work out for some reason. I often wonder if the recipe is right. I knew a woman a few years ago who wrote cookbooks for a well-known, high-end kitchen store/chain. She said they often created recipes without really making them! That was eye opening to me. Maybe it's not me. Maybe it's the recipe. See this image here? It's for a Brown Butter and Fruit Picnic Tart that called for butter and vanilla bean cooked until you get brown butter. mmm, mmm, mmm. (Elli is shown here licking the butter bowl clean.) I have no idea what I did wrong. All I know is that it was definitely not right. The pastry had a buttery, carmel/brown sugar flavor with the yummy raspberries on top. But when baked they became hollow. And they would not fall out of any of the tart pans. You had to eat them with a spoon and dig out every last crumb. We didn't toss them because after tasting them the flavor was SO GOOD we just couldn't. So what did I do wrong? Anyway, my disasters are often not too pretty to look at. Or won't come out of the pan. But ALWAYS taste good. Because when I bake the recipe usually calls for butter, sugar and real vanilla. What's not to love with those three ingredients, right? I don't usually improvise (I leave recipe making to the pros). Because baking is such a science I trust that someone else has tested this first. And when I do - it's usually not good. It's best for me to stick with the recipe. So I wonder, how many recipes do people make that don't make it on the blog or the website? It's all real here in the Mulkey household. I figure I should share the good, the bad and the ugly. Keep it on the up and up. Because I am the average test cook guinea pig. I have distractions (kid, family, dogs) a busy schedule, and a fair attention span for all the details. Pretty typical, right? Lucky for me, I have very willing test subjects. Don and Elli are always willing to taste and tell. I'm super critical. They are much nicer, because they see me freaking out in the kitchen. I'm very lucky. Do you remember the chocolate chip cookies you made with the Dunkin cake mix at Thanksgiving about 1977? They were the mounds of perfectly baked choc. chip cookies with completely hollow middles! They were delish and I could never replicate them. Now, that was a good baking mistake!